"You Are In Such Trouble"
My sister called me the other day and I cheerily answered "Hello!" in a sing-songy happy voice. She greeted me with "You are in such trouble!" Moi? I searched my conscience, it was clear, as usual. I had no idea what I could possibly have done to get in trouble. "You didn't tell me about this new greenhouse place!" It's not my fault she didn't get over there earlier. But now that she's been there, I think she has been back two more times. "You are going to be sooooooo jealous of what I got there". Really? A week later, I dropped by her house and gardens to see what was going to make me so jealous. She was referring to the edging in the picture above. Yes, that is cute and it looks very nice with the soft grayish color of the Lamb's Ear. 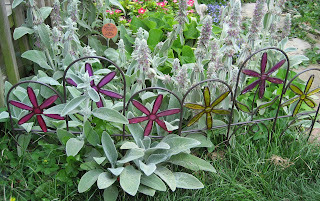 Maybe I'll get some for a spot in my garden where I have some Lamb's Ear by my patio? Then she showed me what they had done with their vegetable garden. I knew about the raised beds, as I'd been telling her to do that for years, and I told her how to do it. But I didn't know they had purchased that wrought iron fencing. It's primarily there to keep the dogs and kids from running through the garden. They bought it in sections and she said it was easy to install. It does look nice and her vegetable garden is doing quite well. But she still has the shrubs with the big spiders in them. And seeing those webs, it looks like they are back this summer. So, am I jealous? I'm not telling, but I'm sure not jealous of those spiders! It sounds like it's not that you didn't tell her, but that she didn't listen! Maybe she just wasn't ready to hear it at the time...but now she is! Also, um, those spiders? No way...I would never go near that bush. I'm too much of a wuss. Carol, you sisters are so funny with each other. I love the wrought iron fencing around your sisters garden. I think the wrought iron fence has a nice look. The spiders we can do without, tho the kids will find them of interest. Yep. The fence is simply lovely. Please tell your sister her garden looks great! The wrought iron fencing gives it an elegant look. 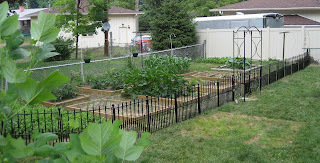 Your sister's veggie garden looks great with the iron fence around it. Don't you love to share gardening with your sister? Me too, we're lucky. Love her veggie garden. It looks quite regal with that wrought iron edging. Who doesn't love lamb's ear. Genie... Yes, my sister needs to learn to LISTEN to me! 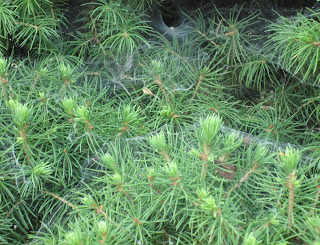 When those spiders come out, no one will go near those shrubs (actually Alberta spruces). Eleanor... Remember last year, those kids didn't want to go outside because of those spiders? I don't think they are too interested in them any more. Garden Tractors... thanks for the comment, I'll pass it along to my sister. Aimee roo... I agree, those spiders... she can keep them! Connie... my sister will read these comments and see how lovely everyone thinks her garden is. Thanks for the comment! Yoland Elizabet... Me? Jealous! Ha! And those spiders of my sisters are so big they try to eat her cats! Layanee... Everyone loves Lambs' Ear, for sure. But those spiders, they are so big no one cares how many bugs they eat. (They are wolf spiders and my sister says they have seen some as big as tarantulas). I love spiders. I am an organic gardener and as far as I am concerned they are a very important part of the bug eating brigade. I have to come over here, you have so many readers, and I know you love tools or you wouldn't have a whole page devoted to your collection of hoes! (Which, by the way, are totally cool.) Anyway, I just got a wonderful tool for my birthday present, a new broad fork. Check it out, I have pictures. Wolf spiders are especially creepy and terrifying. And they hop. Now that's just wrong. Hi Carol...I read the post yesterday. Thanks for the kind comments about DH's Father's Day gift of the garden fence (is that sort of like a kid buying his father a baseball bat?? LOL!) We love the end result, although it doesn't seem to keep the dogs out as we had hoped (maybe it would work better with the gate closed!) The spiders have spun their webs, but I have yet to see any actual beasts. I will admit that there is some weeding that needs to be done in that area, bu there is NO WAY I'm venturing underneath those spruces. Those weeds can grow to their hearts content! Tarantulas are not native to this area - they have to be fishing spiders or nursery web spiders. Does anyone know what they eat? Japanese beetles hopefully??? Birds? :-( Bunnies? Healingmagichands... I checked out your new tool, very nice. I want one! SmilnSigh... I agree, I don't want any part of those spidrs. Lost Roses... I heartily agree. Hopping flower is just plain wrong! Sister with the Homestead... Better count heads each night until you figure out what those spiders eat! You might end up with one less cat or something! Okay, since I'm new here I clicked over to look at the spider post and AAAIIIGH! That is one big spider! Yikes! Don't get me wrong, I totally approve of spiders. I appreciate all their contributions to my garden. But we definitely have an agreement. I stay out of their space, they stay out of mine, yaknowwhatimsayin? Egh.